Well… okay, so the half-reinstalling the NVidia chipset drivers didn’t exactly fix the problem. My system clock has kept good time for the rest of the day, but I couldn’t get Skype to recognise the NVidia soundcard that it was plugged into. So I had to uninstall the drivers and reinstall them. There’s always something, isn’t there! Anyway, it worked fine. My two soundcards are working perfectly now: Creative SB X-Fi for music playback and NVidia nForce for Skype. 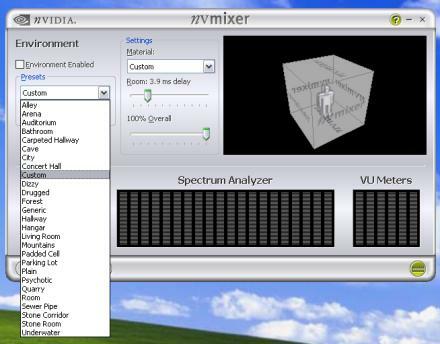 The only thing I’m puzzling over now is the built-in Environments in the NVmixer application (above). Don’t get me wrong, I admire the technological skills of the programmers at NVidia who are able to offer 28 different simulated reverb effects, but why? WHY?! Why would anybody ever need to listen to a piece of music as though he was listening to it in a padded cell (option 18)? Or in a forest (option 12)?! Or a Sewer Pipe (option 24)?!! Gareth: (with a knowing glint in his eye) No need! I have a simulated Sewer Pipe environment effect on my NVmixer control panel. Dave: (with awe) Co-o-o-o-o-o-o-l! I don’t suppose you have the ability to pretend that we’re listening to it in a Stone Room, too, do you? Oddly, it doesn’t have a church or cathedral reverb setting. However, I’ve also just discovered that I can additionally pretend that the room is made from metal, plastic or cloth. Where shall I pretend to listen to the latest Metallica album? How about in a tupperware box in a Parking Lot (option 19). Madness! Utter madness! Next they’ll be telling us that Santa is too scary for children! 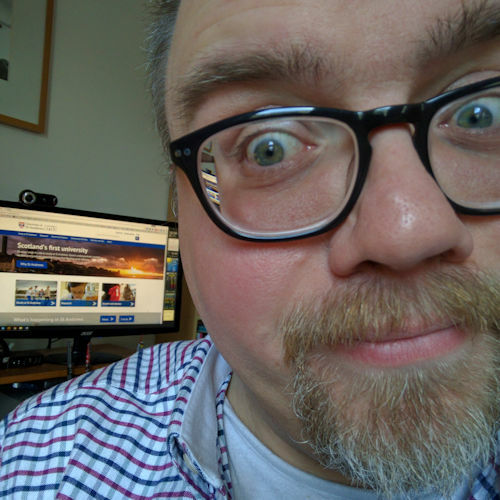 Next Next post: Could this be the job for me…?